The "China smartphone market is to blame" for lower than expected iPhone results, writes analyst Katy Huberty. Though not Apple's fault directly, it seems the smartphone market in general has slumped with reduced growth. As a result of the analysis, Morgan Stanley cut its 12-month share price target for Apple from $253 to $236. While there are other factors, the sales of iPhones in China, a major market for Apple, is cited as the main reason for the downgraded price. It is suggested the issue lies in consumers deciding to hold onto their smartphones for a longer period than previously seen, a phenomenon observed in other countries. "China is following in the footsteps of the US with replacement cycles lengthening," claims Morgan Stanley. Morgan Stanley's price target is still above the analysts' mean, which is around $212. On Friday morning, Apple stock is down $1.30 on the news in a market that is slightly positive, falling to $173.38. Keeping iPhones on hand for longer can be attributed to consumers wishing to save money by not paying out for a new device every two years. Critics may also observe it as smartphone producers failing to entice upgrades at the usual rates, suggesting an innovation leap is in order for the industry as a whole. "Our recent meetings in Asia highlight a weakening China smartphone market, especially at the high-end where suppliers have seen order cuts across most vendors," notes Huberty. This references numerous reports over the last few weeks where firms have warned of lower revenues or have made changes to their workforce due to lower orders. Not all firms in the Apple supply chain are affected the same way, such as Dialog Semiconductor having sufficient components used throughout Apple's products to weather the downturn, while TSMC has secured orders from alternate sources keen to take advantage of its 7-nanometer chip product process. 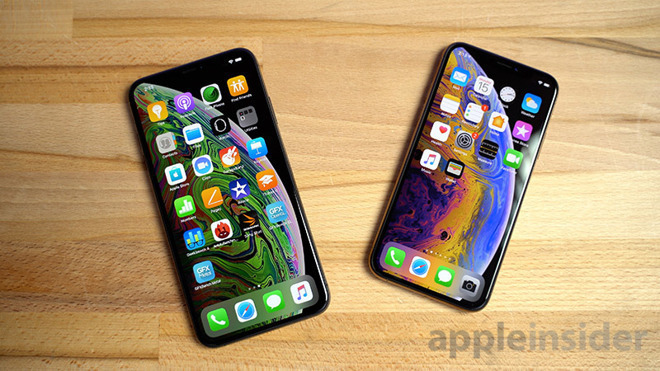 Morgan Stanley joins the roster of other investment firms and analysts to have downgraded Apple's stock following the 2018 iPhone launches, with many of the complaints highlighting supposedly low demand for the iPhone XR. On Thursday, UBS lowered its target from $225 to $210, citing weak iPhone demand. On the same day, Rosenblatt Securities cut to a more pessimistic $165 target, over demand and issues with Apple's pricing strategy aiming for revenue generation rather than unit growth. A Tuesday note from HSBC warned Apple's hardware unit growth is "broadly over for now," with revenue growth only sustained through higher average selling prices. In mid November, Guggenheim Securities reduced its estimates for Apple's full year 2019 revenue from $281 billion to $273 billion, noting iPhone provides nearly 60 percent of the company's revenue but with the expectation its revenue is unlikely to grow much next year. Huberty is typically bullish on Apple in investor notes, but is crucially considered to be more accurate in her pronouncements than other analysts. Notably, she was the first to change her tune about the iPhone X sales prognostications being wildly off-base.